August 10 is International Biodiesel Day. This day honors the event, when the prime model of engine ran on nothing, but peanut oil on August 10, 1893. This event laid foundation for further development of biodiesel and establishment of the holiday. Traditional gasoline is used everywhere in the world. Its efficient and cheap. But it's production and usage pollutes environment, moreover, humanity is running out of oil reserves, that is why use of biodiesel is an important issue. Many countries around the world are interested in development of technologies and they have already tested it and proved efficiency of biodiesel. In 1977 Brazilian scientist Expedito Parente invented and submitted for patent the industrial process for production of biodiesel. His company, Tecbio, is working not only on biodiesel and standardization of this fuel. It also works collaboratively with NASA and Boeing on another bioproduct, bio-kerosene. South Africa initiated use of transesterified sunflower oil as fuel for cars in 1979. In 1987 Austria obtained technology from South Africa and erected the first biodiesel plant. 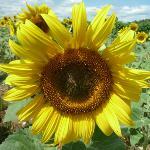 Throughout the 1990s plants producing biodiesel from sunflower oil were erected in many countries across Europe. Nowadays 100% biodiesel is available at many service station across Europe.